You can’t miss the newly ornamented fence on the side of Sisters Elementary School, along Highway 20. It is decorated with colorfully painted swimming fish and scenes of the Three Sisters Mountains, including boulders, water shapes, fish eggs and steelhead smolts. SSD students helped create the art as part of the “River Celebration” project – a collaboration between the Sisters School District, Sisters Folk Festival and the Oregon Community Foundation. A blending of science and art, the program introduced students to river ecology and the importance of rivers to the health of the environment. The installation’s wood pieces were designed and cut at Sisters High School, using hand tools and an automated milling device (CNC machine) recently purchased for guitar-and ukulele-building in the Luthier program. Students at the elementary and middle schools, along with community members, then painted the pieces. 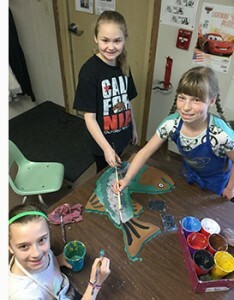 “Through the creation of art, we integrated social studies, science, math and reading to help our students understand the importance of the river and the critical impact it has on the ecology, geology, habitat and biodiversity of Sisters Country,” said Sisters Elementary School Principal Becky Stoughton. Funding for the project came from a Studio to Schools grant the Sisters Folk Festival received from the Oregon Community Foundation, targeting K-8 music and arts education in the Sisters School District. Local artist Laura Campbell, an alumna of Sisters schools, helped the installation take shape and was responsible for the overall design and layout of the artwork. The “River Celebration” art installation is now permanently mounted along the Highway 20 elementary school fence line, adjacent to the school playground, and is a lasting tribute to the Deschutes Watershed and its importance to the region.